Can the public sector outpace the private sector when it comes to innovation? Governments around the world are facing significant political turmoil and enormous economic stress as they struggle with an alarming and unprecedented array of public-policy crises. Whether it’s water scarcity in Brazil, the rural electricity shortfall in India, the financial meltdown in Russia or income inequality and social unrest between law enforcement and minority communities in the U.S., public sector leaders often seem overmatched and overwhelmed at a time when solutions and answers are needed. To make matters worse, government officials are being challenged by citizen, business, media and employee stakeholders to address critical issues in areas ranging from operations to public safety to governance to voting. The repercussions from these issues — which include transparency, accountability, budgeting, spending, regulation, citizen engagement and performance — have steadily eroded confidence in public institutions and public officials. The consequences of these issues have also dampened citizen engagement and participation in activities that are critical to the democratic process, such as dialogue, debate, voting and public service. At the same time, global society is embracing brave new ideas and technologies at an unprecedented pace and scale. In many instances, these new ideas and technologies actually disrupt, without warning, existing and traditional government communication channels, regulations, policies and even laws. Consider the recent technology-driven innovation and disruption from companies like Twitter, Apple, Amazon, Tesla, Coursera, Uber and Airbnb, for example. In addition, some governments are also having a hard time keeping up with technology-driven citizen mobilization because they lack modern information infrastructure that encompasses cloud data management systems, open data platforms, mobile applications, predictive analysis models, online voting and consumer-friendly visualization techniques. The net effect of all this is that democratic government organizations on just about every continent are straining to keep up with the innovative progress that society is making, and, as a result, they’re losing relevancy and legitimacy. The good news is that a growing number of elected officials around the world understand these challenges and they’re confronting the problems with mission-critical digital government leadership that will ultimately help solve pressing and painful societal problems while transforming the public sector into an innovative leader for the new economy of the 21st century. At its heart, digital government leadership is based on the very real and powerful idea that data is an invaluable strategic asset and a critical new natural resource for government — the “oil” of our time. But, unlike oil, government data is a renewable, self-replenishing resource. More specifically, it incorporates operational data-driven solutions, as well as democratic process and governance systems. In technology terms, this means combining and deploying a host of critical, adaptive, effective and lower-cost architectures, platforms, solutions, applications and services — from mobile communications, cloud computing and software-as-a-service to open data, predictive analytics and online voting. If it’s implemented and sustained effectively, digital government leadership has shown that it can achieve measurable and profound performance impact when it comes to citizen participation; transparency and accountability; data-driven and evidence-based decision-making; service and program innovation; budget, spending and operational efficiency; revenue generation that doesn’t include tax increases; and meaningful economic growth and development. One of the most striking developments in the public sector’s emerging new digital revolution is the willingness to shrink or move away from legacy technology. Government leaders know that their antiquated technology solutions are becoming a tremendous burden and drag on 21st century governance responsibilities. And government’s move to technology that is similar to what Apple, Amazon, Facebook and Twitter are providing comes at a time when the public sector is being forced to do more with less. This helps explain why technology decision-makers in government increasingly feel that they have to be in the cloud to manage their data efficiently and cost-effectively. The adoption and embrace of more citizen-friendly digital solutions also allows governments everywhere to mobilize their data management for the future by taking advantage of all the other technologically advanced companies in the world. This is paving the way for 2020, getting ready for 2020, when, for example, there are expected to be 200 billion Internet-connected machines, according to IDC. In addition, developing and deploying these cutting-edge solutions is slowly helping government shed its reputation as a technology laggard. This may be a grossly inaccurate portrayal, but, unfortunately, the perception of being way behind when it comes to technology has become reality here. On a very positive note, governments of all sizes are working hard to become digital innovators today. But, despite the digital progress that governments are making, there are still challenges ahead. Many public sector CIOs, for example, are financially chained to the past. In a recent study commissioned by the National Association of State Chief Information Officers (NASCIO) and Infosys Public Services, a U.S.-based subsidiary of Infosys nearly half (45%) of the state CIOs surveyed indicated that they are spending more than 80 percent of their budgets maintaining existing systems. As a result, they are having trouble freeing up funds to invest in innovative digital solutions. This has to change. And I believe it will change — because governments around the world now recognize that data must be digitally harnessed to increase and improve citizens’ quality of life. 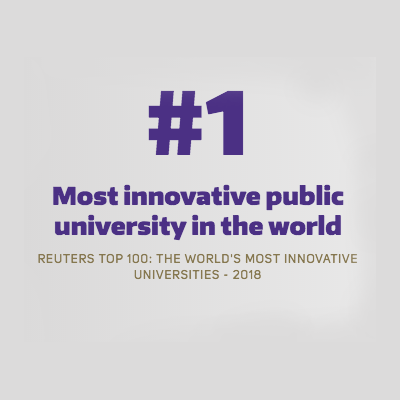 The University of Washington believes that nurturing boundless innovation and creativity empowers students, faculty, staff, alumni and partners to create a world of good. Through the Innovation Imperative, the UW is creating inclusive solutions to society’s grand challenges. This article is one in a series written for CoMotion, the UW’s innovation hub. To learn more from UW innovators, visit uw.edu/innovation. This article also appeared Jan. 21, 2016, on Nextgov.com.